Getting your yarn stash organized can be such a good feeling! Especially, when it’s long overdue. 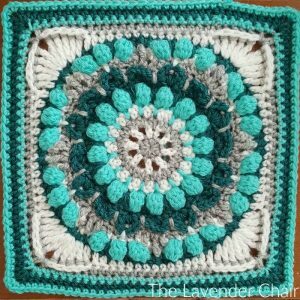 Now, if you are a complete crochet addict like me, you hoard just about any fiber you can get your hands on. As I’m sure you can imagine, I have a lot of yarn. Some of it would end up in the living room and some of it would end up in the bedroom with me. Eventually there was yarn and WIPs in just about every room of the house. And to be honest I don’t even know what was where. So, it was time to get organize! 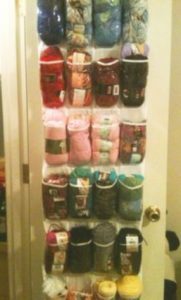 There are several ways that you can organize your yarn and your projects. So, if you are not sure where to start keep on reading! First things first, Where do you plan on putting it all? Bookshelves are sturdy and blend in great with the rest of the furniture in your house. You can even get a custom made one to fit what you need! I love using storage drawers. Unlike bookshelves They are cheap and if I run out of room I could always buy more (which isn’t always a good thing.). 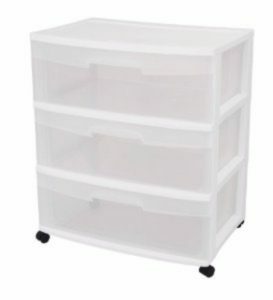 even storage bins are great for storing in a garage or closet. Using a shoe organizer is a great way to organize a small stash. The best thing about the shoe organizer method is that takes up very little space. 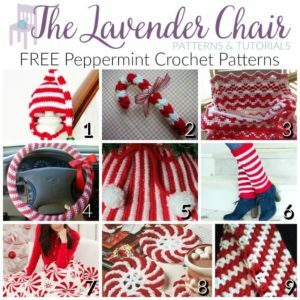 If you want your yarn stash to be out of sight this works well too! The next part always seems be the hardest! How exactly are you going to organize? Some ways work better for others depending on the variation you have! 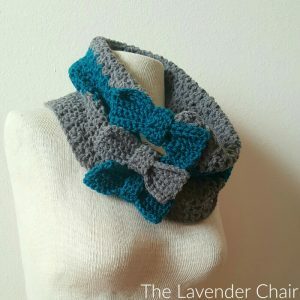 If you don’t have a lot of yarn weight variety in your stash, I’d suggest taking this route! It’s one of the faster ways to organize! 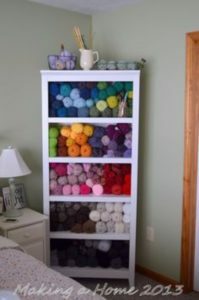 Organizing your yarn by weight is one of the most popular, especially if you combine that with color coordination. This is the method that I use! Some people prefer organizing by fiber. Wool with the wool. Acrylic with the acrylic. 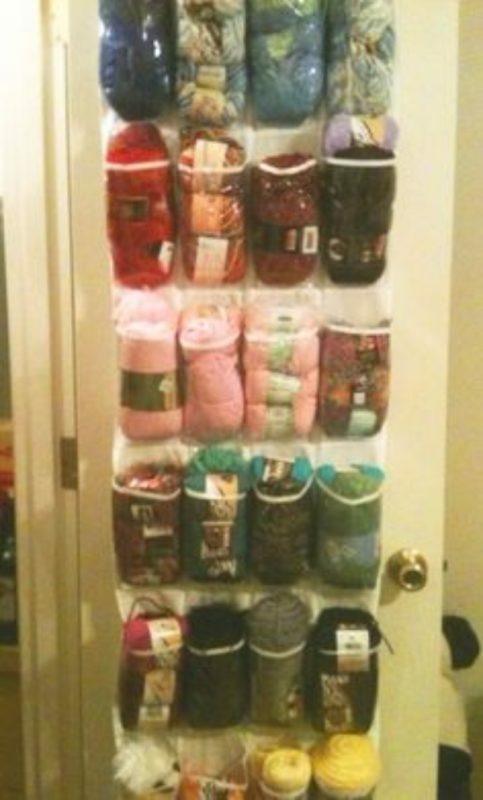 I actually do have a small section of my yarn stash that is organized this way. Basically all my cottons. Great, you are finally all organized, now it’s time to try and keep it that way… Oh boy. Here a couple of suggestions to keep your yarn and projects neatly organized. Rubber Bands are one of my favorite organizational tools. Whenever my skein dwindles down and gets floppy, I usually ball it up and put a rubber band on it to keep it secure! It’s perfect for keeping all my yarn from getting tangled up. Before I start any project I always look in my scrap box before I look in my stash. This keeps you from creating too many unorganized skeins. It’s also a great place to find inspiration and even if you don’t choose to use anything in there, at least you tried! Totes are great for storing your WIPs Having about 5 of them should be perfect. They are also great for when you are traveling. I know, I know, we all hate rules; and no, these rules have not been made to be broken! Never allow yourself to have more then 5 WIPs at one time. When traveling only bring WIPs, so, it’s either that or no crocheting! If it’s less then 1 yard THROW IT AWAY. I know its hard! If you can’t throw it away, put it to use with one of these 10 Things to Do With Scrap Yarn. Just because it’s on sale doesn’t mean you need to buy it! If it is an incredible deal then definitely go for it. It will go on sale again before you’ll need it I promise!